Hilary Ann Swank (born July 30, 1974) is an American actress and film producer. She is the recipient of numerous awards for her career, including two Academy Awards, two Golden Globe Awards, two Critics Choice Awards, and a Screen Actors Guild Award. Swank made her film debut with a minor role in Buffy the Vampire Slayer (1992) before receiving her breakthrough role in the fourth installment of The Karate Kid franchise, The Next Karate Kid (1994). On television, she starred as Carly Reynolds on the eighth season of the Fox teen drama Beverly Hills, 90210 from 1997 to 1998. Swank received widespread critical acclaim for her performance as Brandon Teena, a transgender man, in the biographical film Boys Don't Cry (1999), for which she received her first Academy Award for Best Actress and the Golden Globe Award for Best Actress in a Motion Picture – Drama. For her portrayal of Maggie Fitzgerald in Clint Eastwood's sports drama film Million Dollar Baby (2004), Swank again received her second Academy Award and Golden Globe Award for Best Actress. Swank has also starred in other films including The Gift (2000), Insomnia (2002), The Core (2003), Iron Jawed Angels (2004), Red Dust (2004), The Reaping (2007), P.S. I Love You (2007), Freedom Writers (2007), Amelia (2009), The Homesman (2014), You're Not You (2014), and Logan Lucky (2017). In 2018, she portrayed Abigail Harris Getty on the FX television series Trust. After living in Spokane, Washington, Swank's family moved to a trailer park near Lake Samish in Bellingham, Washington, when Swank was six. She attended Happy Valley Elementary School, Fairhaven Middle School, then Sehome High School in Bellingham until she was 16. She also competed in the Junior Olympics and the Washington state championships in swimming, and she ranked fifth in the state in all-around gymnastics. Swank made her first appearance on stage when she was nine years old, starring in The Jungle Book. When she was 15, her parents separated, and her mother, supportive of her daughter's desire to act, moved with her to Los Angeles, where they lived out of their car until Swank's mother saved enough money to rent an apartment. Swank has called her mother the inspiration for her acting career and her life. In California, Swank enrolled in South Pasadena High School, later dropping out. She described her time at South Pasadena High School, "I felt like such an outsider. I didn't feel like I fit in. I didn't belong in any way. I didn't even feel like the teachers wanted me there. I just felt like I wasn't seen or understood." She explained that she became an actor because she felt like an outsider, "As a kid I felt that I belonged only when I read a book or saw a movie, and could get involved with a character. It was natural that I became an actor because I longed so much to be those other people, or at least to play them." Swank made her film debut in the 1992 comedy horror film Buffy the Vampire Slayer, playing a small role, after which she acted in the direct-to-video drama Quiet Days in Hollywood, where she co-starred with Chad Lowe, who would become her husband for a time. Her first leading film role was in the fourth installment of the Karate Kid series, The Next Karate Kid (1994), which utilized her gymnastics background and paired her with Pat Morita. In 1994, she also starred in the drama Cries Unheard: The Donna Yaklich Story as the abused step-daughter who was protected by Donna (Jaclyn Smith). In 1995, she appeared with British actor Bruce Payne in Kounterfeit. In 1996 she starred in a TV movie, family drama Terror in the Family, as a troubled teenager. In September 1997, Swank played single mother Carly Reynolds in Beverly Hills, 90210 and was initially promised it would be a two-year role, but saw her character written out after 16 episodes in January 1998. Swank later stated that she was devastated at being cut from the show, thinking, "If I'm not good enough for 90210, I'm not good enough for anything." The firing from Beverly Hills, 90210 freed her to audition for the role of Brandon Teena in Boys Don't Cry. To prepare for the role, Swank lived as a man for a month and reduced her body fat to seven percent. Many critics hailed her work as the best female performance of 1999 and her work ultimately won her the Golden Globe Award and Academy Award for Best Actress. Swank had earned only $75 per day for her work on the film, culminating in a total of $3,000. Her earnings were so low that she had not even earned enough to qualify for health insurance. Swank again won the Academy Award and Golden Globe Award for Best Actress for playing a female boxer in Clint Eastwood's 2004 film Million Dollar Baby, a role for which she underwent extensive training in the ring and weight room, aided by professional trainer Grant L. Roberts, gaining 19 pounds of muscle. With her second Oscar, she had joined the ranks of Vivien Leigh, Sally Field and Luise Rainer as the only actresses to have been nominated for Academy Awards for Best Actress twice and won both times. After winning her second Oscar, she said, "I don't know what I did in this life to deserve this. I'm just a girl from a trailer park who had a dream." In 2006, Swank signed a three-year contract with Guerlain to be the face of the women's fragrance Insolence. She received a star on the Hollywood Walk of Fame in the motion picture category on January 8, 2007; it was the 2,325th star presented. In 2007, Swank starred in Freedom Writers, about a real-life teacher, Erin Gruwell. Many reviews of her performance were positive, with one critic noting that she "brings credibility" to the role, and another stating that her performance reaches a "singular lack of artifice, stripping herself back to the bare essentials". Swank next starred in the horror film The Reaping (2007), as a debunker of religious phenomena. Swank convinced the producers to move the film's setting from New England to the Deep South, and the film was filmed in Baton Rouge, Louisiana when Hurricane Katrina struck. The same year, she also appeared in the romantic drama P.S. I Love You with Gerard Butler. Swank portrayed the pioneering aviator Amelia Earhart in the 2009 biopic Amelia, which she also co-executive produced through 2S Films, a production company she established with producer Molly Smith. In October 2011, Swank attracted controversy for attending an event in Chechnya's capital Grozny on the 35th birthday of Chechen president Ramzan Kadyrov on October 5. After wishing him "Happy birthday, Mr. President", she reportedly claimed knowledge about Kadyrov saying, "I read. I do my research." Following criticism from human rights groups, that reported having informed her about the human rights abuses in Chechnya prior to the event and asked her to reconsider her participation, Swank said she was unaware that Kadyrov had been accused of human rights violations and that she "deeply regrets" taking part in the lavish concert. She donated her personal appearance fees "to various charitable organizations". In 2012, Swank's audiobook recording of Caroline Knapp's Pack of Two: The Intricate Bond Between People and Dogs was released at Audible.com. In 2013, she starred in the television film Mary and Martha alongside Brenda Blethyn. In 2014, Swank played the lead role of Kate Parker, a woman whose life is shattered when she develops the degenerative disease ALS, in You're Not You. The film co-starred Emmy Rossum and Josh Duhamel. In 2017, she appeared in Steven Soderbergh's heist comedy Logan Lucky as Special Agent Sarah Grayson, alongside Channing Tatum and Daniel Craig, and portrayed lawyer Colette Hughes in Bille August's drama film 55 Steps. Swank will star in and executive produce the Alzheimer's disease drama film What They Had, directed by Elizabeth Chomko. She has been cast in two upcoming television projects; she will portray Gail Getty in the first season of FX's anthology series Trust, and will star as Laura Murphy in Alejandro González Iñárritu's drama series The One Percent. While filming Quiet Days in Hollywood, Swank met actor Chad Lowe. They married on September 28, 1997. They announced their intention to divorce on January 9, 2006, which was finalized on November 1, 2007. In 2007, Swank began dating her agent, John Campisi, but they ended their relationship in May 2012. On March 22, 2016, Swank announced her engagement to Ruben Torres, a financial advisor with UBS and former professional tennis player. The two had been dating since May 2015. In June 2016, Swank's representative confirmed she and Torres had ended their engagement. On August 18, 2018, she married entrepreneur Philip Schneider after two years of dating. ^ a b "Senate Resolution 16 – Introduced". The Iowa Legislature. April 19, 2005. ^ a b "Hilary Swank Biography: Animal Rights Activist, Film Actress, Television Actress (1974–)". Biography.com (FYI / A&E Networks). Retrieved March 22, 2016. ^ "Hilary Swank". Ringgold County IAGenWeb Project. Retrieved October 17, 2011. ^ "Hilary Swank Biography (1974–)". FilmReference.com. Retrieved September 9, 2010. ^ a b "Hilary Swank Biography". Yahoo! Inc.
^ "Dowling Family Genealogy Frances Martha DOMINGUEZ". Ancestry.com. Archived from the original on June 13, 2016. Retrieved June 12, 2016. ^ a b c d "Interview". Inside the Actors Studio. YouTube. 2009. ^ "The Swank Family". Ringgold County IAGenWeb Project. Retrieved October 17, 2011. ^ a b c Longsdorf, Amy (January 3, 2007). "Swank: Acting gave me sense of focus". TimesLeader. Archived from the original on January 10, 2007. Retrieved January 10, 2007. ^ a b "Hilary Swank Biography". Tiscali UK. 2006. Archived from the original on December 26, 2008. Retrieved November 24, 2006. Biography spreads across 9 web pages. High School information is on page 2. ^ Feitelberg, Rosemary (October 18, 2016). "Hilary Swank Launches Mission Statement, Recalls Meeting Calvin Klein, Talks '55 Steps' and 'Lucky Logan'". Women's Wear Daily. Retrieved June 21, 2017. ^ "Hilary Swank tells all to Extra". United Press International. January 3, 2007. Retrieved October 17, 2011. ^ Carstensen, Melinda. "Hilary Swank: Providing Pet Therapy for At-Risk Youth". Modern Wellness Guide. Retrieved June 21, 2017. ^ "Hilary and Huncky Patrick Picture Perfect Premiere". Hello!. January 5, 2007. Retrieved January 7, 2007. ^ "Hilary Swank reaping rewards". The Sydney Morning Herald. April 23, 2007. ^ "Jamie Bell's life story put on screen". The Guardian. July 17, 2001. ^ a b c Leung, Rebecca (March 2, 2005). "Hilary Swank: Oscar Gold – 60 Minutes". CBS News. Retrieved September 9, 2010. ^ Stuever, Hank; Booth, William (February 28, 2005). "At the Oscars, a 'Baby' Boom". The Washington Post. ^ Freydkin, Donna (October 10, 2007). "Hilary Swank enjoying the scent of 'Insolence'". USA Today. ^ "Hilary Swank gets star on Hollywood Walk of Fame". USA Today. January 8, 2007. ^ Sanford, James (January 5, 2007). "Swank brings credibility to 'Freedom Writers'". Kalamazoo Gazette. Archived from the original on March 26, 2007. Retrieved January 6, 2007. ^ Roach, Vicky (March 22, 2007). "Hilary's all class". The Sunday Telegraph. Retrieved March 25, 2007. ^ a b Hart, Hugh (April 1, 2007). "Real scare for cast of 'Reaping'". San Francisco Chronicle. Retrieved April 1, 2007. ^ "Hilary Swank to Star in PS, I Love You". MovieWeb. May 19, 2006. ^ Fleming, Michael (February 7, 2008). "Hilary Swank to play Amelia Earhart". Variety. Retrieved September 9, 2010. ^ Kit, Borys. "Hilary Swank, Molly Smith form 2S Films". The Hollywood Reporter. Retrieved June 3, 2008. ^ "Hollywood stars fly in on Chechen leader's birthday". BBC News. October 7, 2011. ^ Elder, Miriam (October 13, 2011). "Hilary Swank 'regrets' partying with Chechen leader Ramzan Kadyrov". The Guardian. Retrieved October 14, 2011. ^ "Russia: Celebrities Should Refuse Pay for Chechnya Gala". Human Rights Watch. October 11, 2011. Retrieved October 14, 2011. ^ "Hilary Swank apologizes". Human Rights Foundation. October 13, 2011. Archived from the original on October 17, 2011. Retrieved October 14, 2011. ^ "Hilary Swank Will Donate Chechen Cash To Charity". The Huffington Post. October 14, 2011. Retrieved October 17, 2011. ^ "Pack of Two: The Intricate Bond Between People and Dogs". Audible.com. Archived from the original on September 21, 2013. Retrieved September 18, 2013. ^ Genzlinger, Neil (April 19, 2013). "Bereaved and Incited by Malaria". The New York Times. Retrieved September 18, 2013. ^ Busch, Anita (June 9, 2016). "Hilary Swank Latest To Board Steven Soderbergh Heist Film 'Logan Lucky'". Deadline Hollywood. Retrieved August 24, 2016. ^ Kit, Borys. "Hilary Swank, Michael Shannon to Star in Drama 'What They Had' (Exclusive)". The Hollywood Reporter. Retrieved March 17, 2017. ^ Otterson, Joe (April 26, 2017). "Hilary Swank Joins Danny Boyle's FX Limited Series 'Trust' (EXCLUSIVE)". Variety. Retrieved April 26, 2017. ^ Littleton, Cynthia (August 12, 2014). "Starz Orders Drama 'One Percent' to Star Ed Helms, Hilary Swank". Variety. Retrieved October 16, 2015. ^ Dominguez, Robert (March 28, 2000). "Hilary Swank's Long Journey To Hollywood". Daily News. Archived from the original on April 22, 2016. ^ "Hilary Swank, husband Chad Lowe split". Today.com. January 9, 2006. Retrieved June 21, 2017. ^ Lindenmuth, Kayy (March 31, 2010). "The Hottest Heartbreak Hairstyles: Hilary Swank". Cosmopolitan. Archived from the original on March 4, 2016. Retrieved June 25, 2012. ^ "Hilary Swank and John Campisi Split". People. August 20, 2012. Archived from the original on October 14, 2016. Retrieved August 20, 2012. ^ Fisher, Kendall (March 22, 2016). "Hilary Swank Is Engaged!". E! Online. Retrieved March 22, 2016. ^ "Ruben Torres: An Ace At Finance". Westside People Magazine. July 17, 2014. Retrieved March 22, 2016. ^ Guglielmi, Jodi (June 6, 2016). "Hilary Swank Calls Off Engagement". People. Retrieved June 20, 2016. ^ Webber, Stephanie (June 6, 2016). "Hilary Swank and Ruben Torres Split. End Engagement". Us Weekly. Retrieved June 20, 2016. ^ "Hilary Swank had her vegan wedding cake FedExed from Mexico for forest nuptials". USA TODAY. Retrieved August 22, 2018. 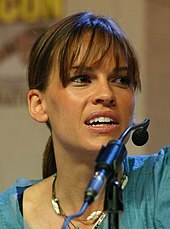 Wikimedia Commons has media related to Hilary Swank. "Hilary Swank Biography and Interview". www.achievement.org. American Academy of Achievement. June 22, 2007.